Finally! 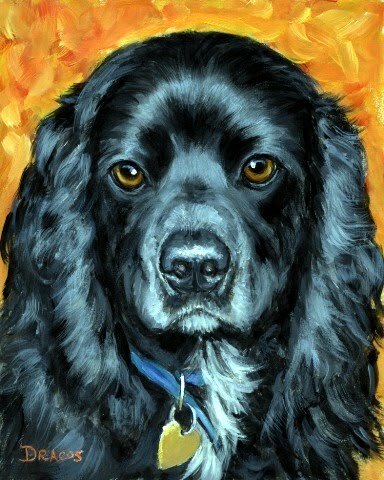 I have received so many requests for a black cocker spaniel, and I have finally gotten to it on my huge to-do list! Sorry it took so long for those of you who have patiently waited for it to be done. I'm also working this week on a commissioned German shepherd painting, which is proving to be a really difficult one. 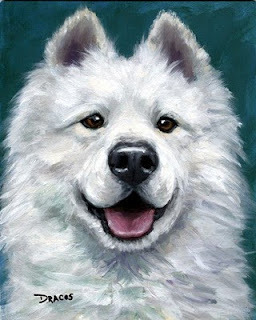 She, Zoey, is lying in the snow and looking up at the viewer, so the pose is adorable but awkward at the same time, details are difficult to see due to the lighting, and it's just difficult to paint because it's a full-bodied painting on an 11x14 canvas. But I think it'll come out great when it's completed. It's a challenge but a good one. I have another painting in progress, too, a standing German shorthaired pointer, for which I also get many, many requests. It'll be completed sometime next week. Oh, and one more painting in progress - and put aside for the moment! : a single daffodil I had in my front yard early this spring. 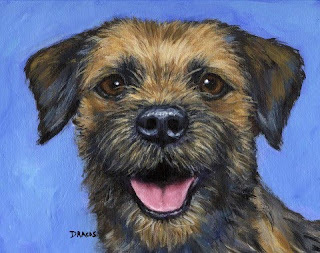 I thought, oh, painting a daffodil will be so easy compared to painting dogs. Absolutely not! Not for me, anyway. It's much, much harder for me -- but I will tame this daffodil eventually! This is a sweet pug painting I recently completed from photos submitted by a customer. She said she never sees any brindle pug artwork anywhere, and now I understand why. It was really hard to get the brindle "feel" in the painting without trying to paint every hair -- which is what I'm trying to learn to avoid! The original is a bit different from this 8x10" image in that it's on a 24x24" canvas. It is for sale. Contact me if you're interested. And last for today -- but definitely not least!! 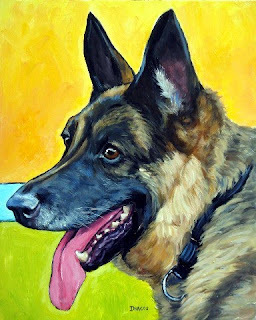 - is this German Shepherd painting I did just two days ago. Now, I feel that I'm really starting to change. I feel that I captured the "shepherdness" of this dog (her name is Zoey, and I'm doing another painting of her as a commission for her mom) but gave her a lot, lot more life than many of my more serious paintings had (in my opinion), and yet with the bright background, gave her some playfulness, too, without taking away from her beauty at all. 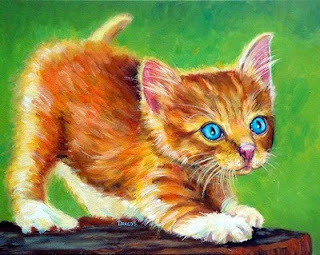 Again, this painting makes me smile. I would hang this one in my living room even if I didn't have a German shepherd, just because I like the looks of the painting. That's a good thing. I like this direction. I dooooooo hope I keep it up (fingers crossed -- much too tightly!). 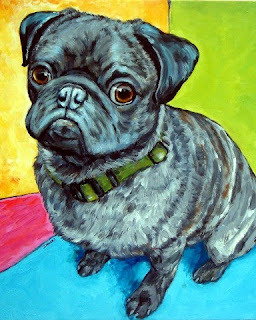 I'm currently working on a really, really hard painting: a brindle pug. I've had a few pretty good paintings over the past few ones, and now I'm nervous. Can I keep up the momentum of change? Or will I choke? Seriously, this becoming the best painting I can is the hardest endeavor I've ever, ever taken on in my whole life -- and I've taken on some doozy challenges, I promise you. They all pale in comparison to this one. What do you think about my new direction? Okay, this little kitty painting just makes me smile. Could I have worked on it for weeks more? Sure thing. But I resisted! And I'm happy with it. Makes me smile - big time! That's a good thing. Hope it made you smile, too. Just a reminder of my daughter's facebook page for us again: http://facebook.com/larkstudios. (Oh, a quick note about the facebook name she chose: Often in error, I would be talking about my daughter and her husband and call them "Lark" by mistake (Lara, and her husband, Mark). Now, it's become a bit of a family joke, and the collective name has stuck. They are now Lark - much easier than Lara and Mark, don't you think? Now, how are we going to include my precious little almost-four-month-old granddaughter's name into the mix? (Her name is Elena). 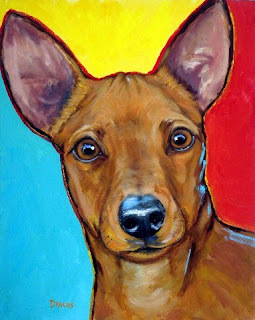 A red Minpin I finished in the last few days. Well, I'm finally getting somewhere. This looser (but controlled) style is starting to feel a bit more comfortable. And I'm getting back to something I lost somewhere along the way: bright, happy backgrounds, more graphic overall feel, if that makes any sense. Although I added a bit of -- dare I say it, the "W" word - whimsy to my work, I think I'm still being very faithful to the structure and personality of my subject. Let me know what you think of this new direction if you have the time. I'm anxious about what others will think. I'm showing the most recent ones for the first time this weekend. Scary. Wow, I had no idea I had not posted on my blog in such a long time! I've got a lot of paintings to catch up on. I'm afraid I've missed a few, but they're all on my website (http://www.wildwildthings.com/) if you absolutely must see every single one. I always list them on my home page just as soon as they're done. 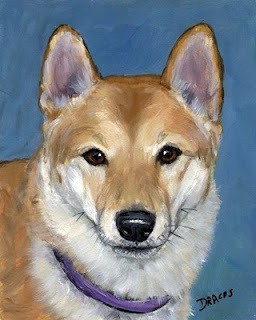 This is a shiba inu portrait, still just coming out of my "dark days." I'm pretty happy with this one. I didn't feel the need (well, I might have felt the need, but I resisted!!!) to put in every single hair on ths one. That's a good thing! Okay, change is starting to show with this painting. It's small, but it's much looser, makes me smile. Can I keep up this direction? Or will I head off in another completely different one? Who knows? I certainly don't! We'll see. Stay tuned. 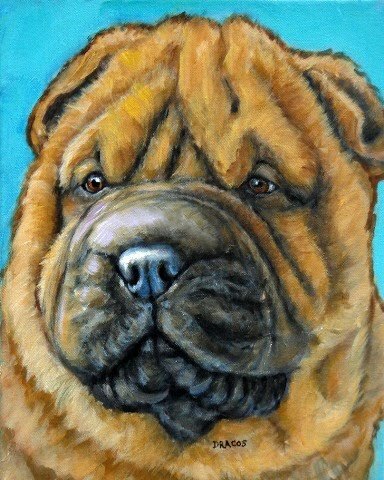 Another painting, a shar pei puppy, as I'm coming out of my "dark days." This one was really, really difficult for me. This painting is of a Samoyed. Still coming out of my "dark period," and I think this one is a bit looser. I'm getting somewhere now, but I still have a long way to go. 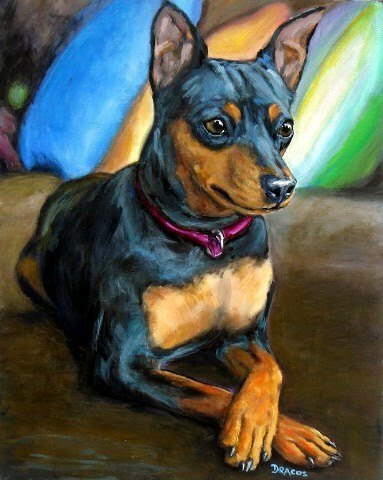 This beautiful black-and-tan miniature pinscher, "minpin" or "min pin," is one of the next paintings to come out of my "dark days" that I described in the previous entry. I'm trying to get them (the paintings) out in pretty much the order that they occurred, and I think you can see the changes occurring in my work these days. Who knows where I'll end up? But, wow, is the "trip" challenging, exciting, the hardest work I think I've ever done, FUN!, SCARY, SCARIER!! 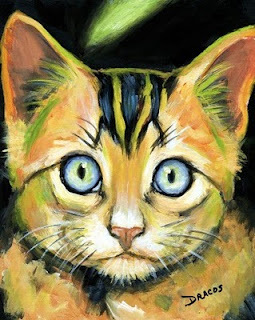 !, horrifying, but thrilling, exhilirating, frightening, FUN, and finally, I hope rewarding and pleasing to both you, my viewer, and me, the creator/painter. I've been working a lot lately, going through some difficult times with my work and not producing much. I can't explain exactly what was going on, but I knew I was going in a direction that I wasn't especially happy with in my work -- too "photo-realistic, not grabbing me and making me - and you - smile the way I like. (There's just enough negative or even neutral in this world these days that I want my work to help bring even just a bit of cheer into our lives.) So, anyway, I've been working away, really hard actually, but not able to get off that path I had started going down -- well, I think I finally have started forging a new path for myself. I expect you're going to be seeing some - for me, anyway - exciting changes in my work in the future. I made the hurdle!!!! This piece is the first to come out after my few weeks of wrenchingly hard work - with almost nothing to show for it - except in my head, of course, where lots, lots, lots was going on! This is a border terrier, and the original as well as prints and pendants are available on my website. There'll be other images to follow in short succession after this one until I am current again.